This black tungsten ring features the military style camouflage pattern laser engraved on the outside. This ring is 7 millimeters in width and is made in comfort fit design. The outside of the ring is complete flat, fashioned in pipe cut style. 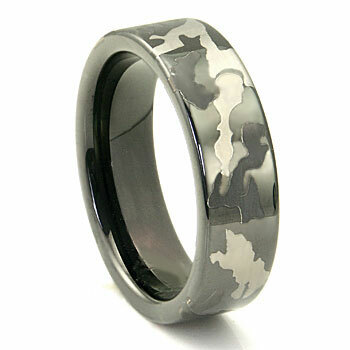 The nice heft of tungsten carbide combines with the camo style design creates this masculine and chic wedding band. Great quality. Very well made. It looks even better in person. I also appreciated the excellent customer service. I had to exchange mine twice due to size and the response to my inquiries was always very timely. I highly recommend Titanium Kay. My husband had wanted this ring for months. I purchased it for his birthday and couldn't wait to get it. When the ring arrived, I was a bit disappointed. Don't get me wrong, it is a terrific ring, but it looks different in real life than the picture. It is actually black just as the description says but the picture does not show it well. We still really liked the ring, it just isn't what we were expecting. Also, my husband is a bigger guy and desired a wider ring. This one is 7mm so if you like wider, this one is not for you. Otherwise, terrific product. Just know in advance that the background on the ring is indeed black. This is the perfect ring for my son who is getting married in August. He is Marine and served our country! He loves it! Thanks. Titanium Kay is the only place I will buy my wedding band from!!!!! They stand by there product and if anything happens they are there to make it right!!! I love this ring with the camo option it fit my hand and personality perfectly!!! Thank you Titanium Kay for getting it to me so fast!!! If you are thinking about buying something from them stop thinking and do it you won't be sorry!! !